Adam is a handsome, intelligent, and outgoing, young man who's looking for a family. He loves outdoor activities like basketball, football, swimming, Frisbee, fishing and hunting. He also loves playing checkers, Chutes and Ladders, Sorry, and Trouble board games. But, that's not all. He wants you to know he's also pretty good at Wii Resort Sports and Mario Kart. His favorite movie is Air Bud and favorite television show is Teen Titans. As far as school goes, he really likes recess and math. Some favorite foods are chocolate, Reese's, and Skittles! What about sports? Well, his favorite sports team is the Pittsburgh Steelers. He enjoys listening to country music and his favorite artist is Tim McGraw. Adam likes doing chores around the house such as dishes, sweeping, and cleaning the table. He would like to be truck driver or work at McDonald's when he grows up. When asked for one wish Adam said, ?To have a family who has lots of care and love for me.? 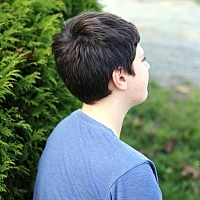 Adam would like a forever family with a mother and a father. He thinks that living in a family with older and younger siblings, aunts, uncles, and grandparents would be nice, too! He still has some contact with his biological parents. Adam is not currently free for adoption. For more information about Adam, please have your family worker reach out to Russ McCurdy at rum@the-institute.org or call the SWAN Helpline at 1-800-585-SWAN.